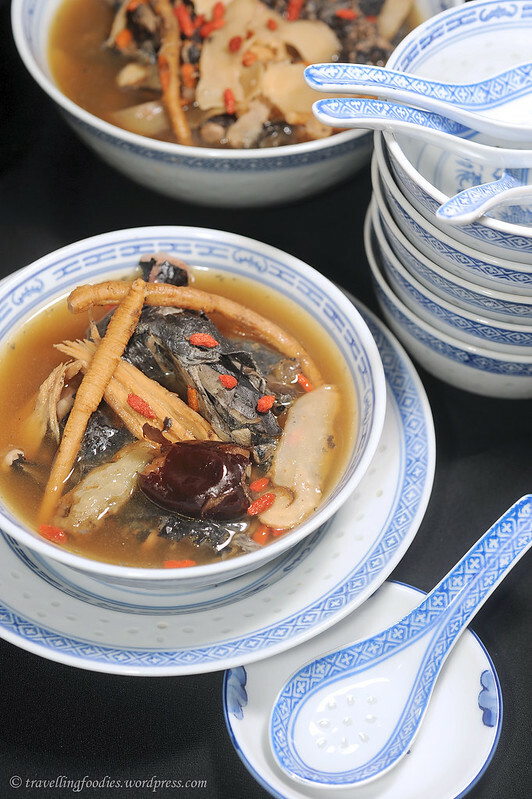 Silkie Black Chicken is a popular choice for many traditional chinese soups for its curative properties in 食疗 chinese food therapy. 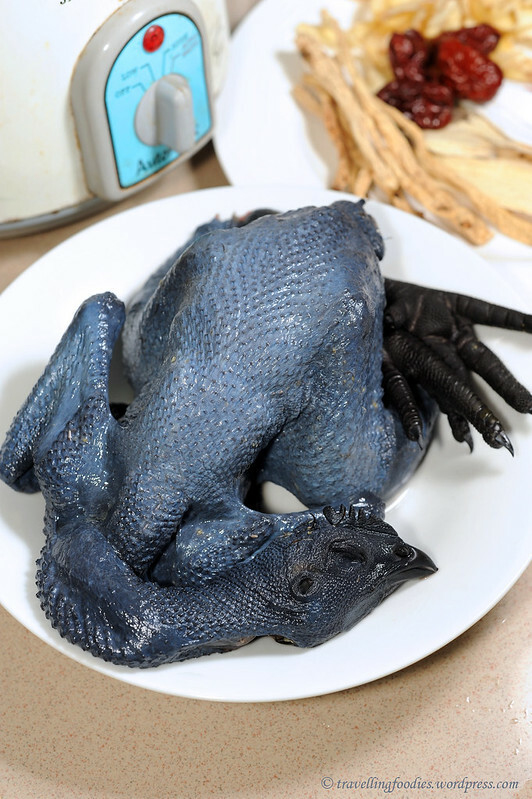 It is a curious looking bird as the melanism is not only skin-deep, but perpetuates down to its flesh and bone, giving rise to its chinese name 乌骨鸡, literally to mean “black bone chicken” . 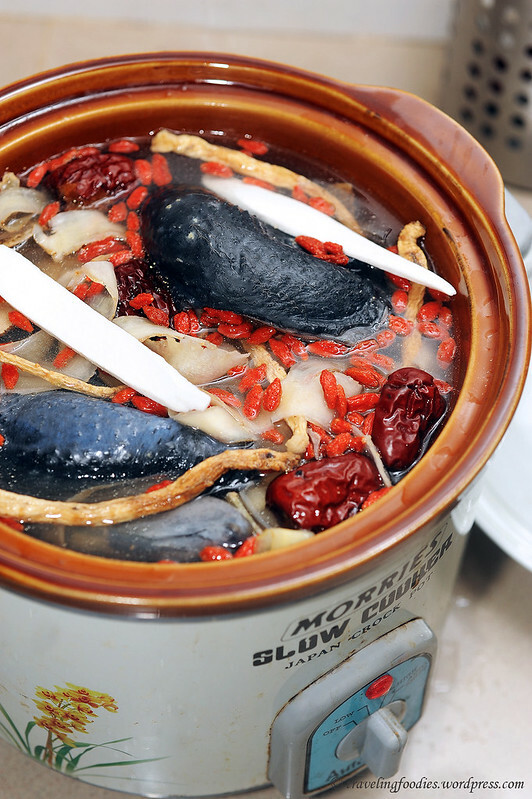 Traditionally, this soup is “double-boiled”, which means to house all the soup ingredients in a ceramic urn-like vessel, which is in turn placed into a pot of simmering water. But we use an electric slow cooker at home, same effect for lesser effort! 1 handful of 枸杞 goji berries aka wolfberries Lycium sp. While waiting for the water to come to a boil, rinse all the herbal ingredients quickly and set aside. Clean the chicken, plucking any remnant feathers, especially under the wing joints. Chop into 4 large pieces. Place the chicken pieces in a large bowl and pour boiling water over it carefully. Drain away the cloudy/bloody water and set aside. To a slow cooker, add the chicken pieces, and all the ingredients (except goji berries) followed by just boiled water. The chicken should be completely submerged with at least one inch depth of water above it. Some of the ingredients e.g. red dates may stay afloat. That is normal as they will sink subsequently when properly reconstituted through boiling. Turn the cooker to “High Heat” and wait for the ingredients to come to a boil again. After which, turn down to “Low Heat” and allow the soup contents to slowly simmer for 4-6 hours. 10 mins before serving, add salt to taste and goji berries. At the end, I’ll like to share some pointers one has to note in the making of this soup. During the preparation of the chicken, the chopped pieces are first quickly blanched with just boiled water. This allows any blood clots and remnants of internal organs, especially around the rib cage to cook and easily removed subsequently. These would make the soup cloudy and impart a slight bitter taste to the soup subsequently if not removed. Water must be hot when it is poured into the cooker. If normal tap water was used, a much longer cooking time is required as it takes quite a while for water to come to a boil using a slow cooker. Goji berries are not added at the beginning with the other ingredients as they will impart of sourish taste from prolonged cooking. Gently steeeping them at the very end is enough for them to become sufficiently soft to be eaten. For a slightly sweeter edge, 金丝蜜枣 candied dates can be added in place of red dates, either as partial replacement or full substitution. Do not attempt to hasten the cooking process by cooking the soup in a pot directly over the stove or leaving the soup to cook under “High Heat” on the slow cooker. 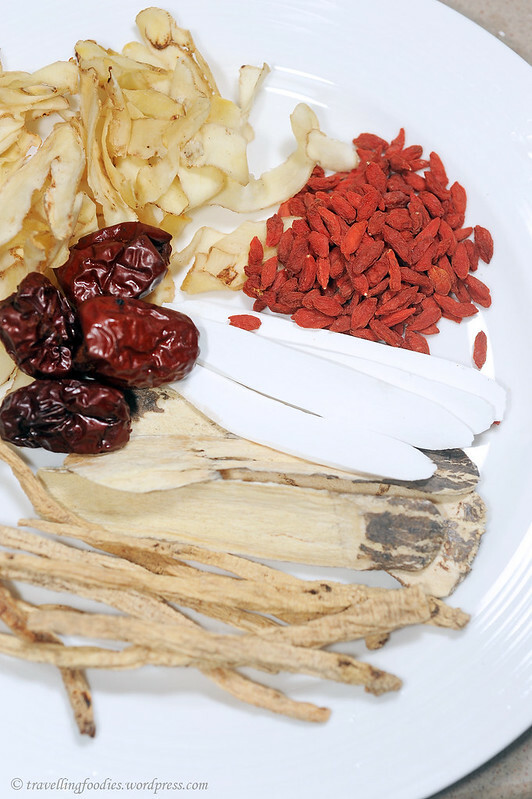 TCM believes in the differing effects of 武火 and 文火 during the preparatory stages of food therapy. 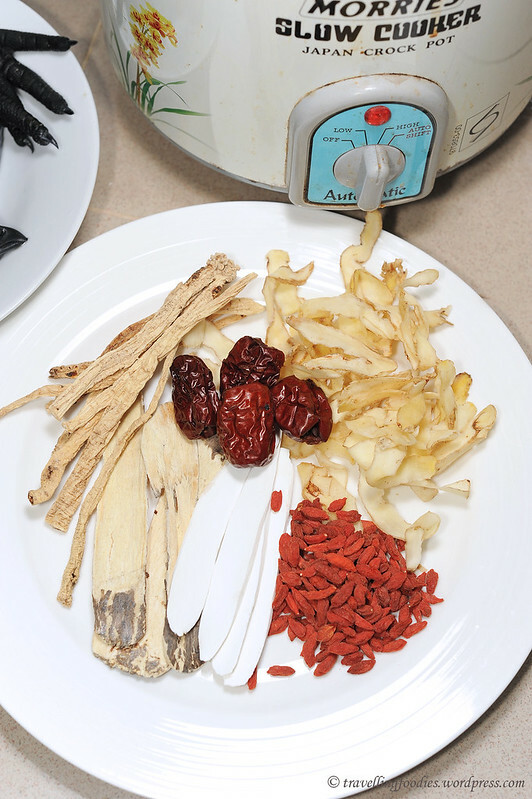 A very gentle simmering 文火 is deemed as the best way to preserve the beneficial qualities of these curative foods. 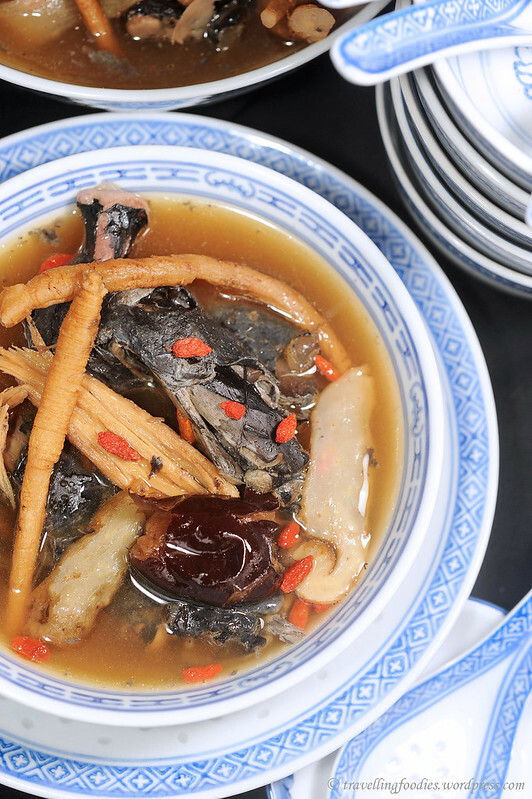 So patience is really a key in making many TCM soups like this one. This entry was posted on November 26, 2012 by Alan (travellingfoodies). It was filed under Food, Simple Eats and was tagged with 玉竹, 药炖乌骨鸡, goji berries, Herbal Black Chicken, red dates, silkie chicken, soup, TCM, traditional chinese medicine, wolfberries, 党参, 北芪, 枸杞, 淮山, 乌鸡. I love to boil this when the kids are back 🙂 nutritious and aromatic too ! I love this soup, especially with two slices of 当归 or a few black dates, and hard boiled eggs. You reminded me it’s a nice time to make this soup again.